Why Drink Kombucha? 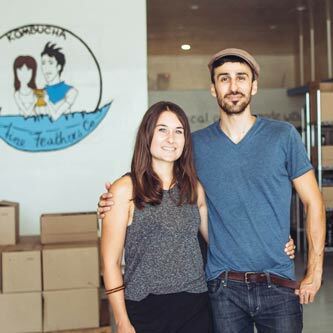 - Fine Feathers Kombucha Co.
Kombucha is a great way for people with lactose intolerance or people who abstain from consuming animal products to introduce probiotic organisms into their diet. It is also a way to vary the probiotic sources and diversify the probiotic strains for people who already consume other raw fermented products (e.g. yogurt, kefir, sauerkraut, etc.). Probiotics are beneficial microorganisms who work inside of the intestines, along with the intestinal microflora, to promote and maintain a healthy digestive and immune function. A healthy digestive tract has a ratio of about 85 percent probiotic (good) bacteria to 15 percent pathogenic (harmful) bacteria. Studies have shown that a typical North American diet results in a mirror image of those numbers: only 15 percent beneficial bacteria to 85 percent pathogenic. Such disproportionate balance causes the various systems in the body to be burdened and, sometimes, overwhelmed with fighting off the harmful bacteria instead of performing their normal functions, leading to disease. Unpasteurized fermented foods, such as kombucha, introduce beneficial microorganisms in the intestines, which in turn help restore the healthy balance by repopulating the gut. Perhaps the most beautiful thing about kombucha is its ease of digestion and absorption. Because digesting foods is where the most of the body’s energy goes, kombucha would rate very high on a scale of sustainable digestion. Raw, unpasteurized kombucha (such as Fine Feathers Kombucha) contains its own enzymes (like all unprocessed, raw foods), which basically means that it would require virtually no energy to digest. The fermentation process causes many beneficial acids to form in kombucha. Acetic acid, lactic acid, butyric acid, and malic acid, among others, are known to be antiseptic and antibacterial. Many harmful bacteria, such as E.coli and Salmonella, cannot survive in an acidic environment with a low pH. Ascorbic acid, also known as Vitamin C, another organic acid formed during the fermentation process, is known to be an immune booster and serves a role in fighting colds. Kombucha may also help with managing weight. To begin with, it has a very small amount of calories (approximately 30 calories per serving). Because of the acetic acid, drinking kombucha prior or along with a meal will delay the emptying of the stomach, which contributes to a prolonged feeling of satiation. The naturally-present probiotic content and the colon-stimulating oxalic acid (also found in vegetables such as chard and rhubarb) in kombucha promote elimination, which is also a major contributor to digestive health and weight control. In our experience, kombucha also tends to suppress appetite when consumed on an empty stomach. Despite its physical properties of being a weak acid (~pH 3), kombucha has been shown to alkalize the body (much like lemons, which are also acidic). Our blood is slightly alkaline, around pH 7.4 (pH 7 being neutral). Eating acid-forming foods (most cooked, denatured, processed foods), and stress (environmental, physical, psychological or emotional) are amongst the main factors for lowering our bodies’ overall pH. When the body goes into an acidic state, its normal functions become disrupted, which eventually results in disease. Consuming alkalizing foods, such as kombucha, help alkalize the blood, which returns the body to its natural state. A common misconception about kombucha is that it is loaded with sugar. While this may be the case with certain commercial brands, the sugars found in the resulting kombucha ferment are simple sugars (glucose, fructose) and they require minimal or no digestion. Typically, the sugar content in one serving (8 oz.) of kombucha is in the range of 2-7 grams depending on the length of the ferment. Don’t forget to drink your water, though. Drinking kombucha is not a replacement for drinking water, so we do recommend that you consume the same amount of water you normally would. We, personally, like the guideline of consuming about half your weight in ounces of water (e.g. if you weigh 150 pounds, your average daily water intake should be approximately 75 ounces of water). Additionally, drinking water would speed up the elimination of toxins.